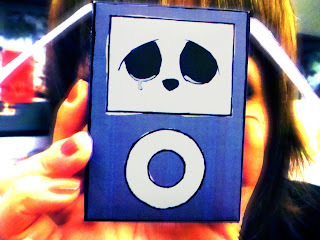 Feelings: We attended the fifth annual Animation Block Party for "Dragon's Claw" screening at BAM Cinematék. It is a beautiful venue without pretention, and we were honored to be a part of the only animation festival in New York. All other selected films and videos were quite impressive, and RB and I were ecstatic to find that "Dragon's Claw" was awarded for the best music video. "To be on the same list as Don Hertzfeldt (who won the best narrative short) is amazing. He's my hero," RB said. They had an after party at a low-key bar with pretty back yard, 4th Avenue Pub. Free beer is always good, but what was better was ice cream cake from Baskin Robbins. 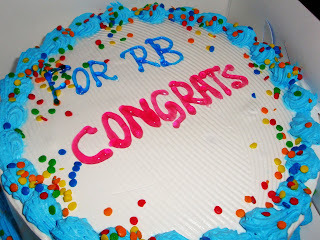 Our friend BinX2 brought us a cake that says, "For RB Congrats!" We shared this surprisingly delicious cake with everyone, and it became the centerpiece of the backyard. I had never tried Baskin Robbins' ice cream cake, but this is something I might consider getting again. It came with chocolate sponge cake, vanilla ice cream and whipped cream on top. When the ice cream started to melt, it went incredibly well with the cake. It was not overly sweet and went surprisingly well with free beer! (classy!) Thank you BinX2 for this ice cream surprise! Our night was still not over, however. OSha led us to a secret boat party located in the middle of Bushwick. From there, we were taken by a van to the boat party. There was a dance party inside the boat, and people were grilling up burgers at the top deck. We had no idea where we were, but with good view, music and people, we finished up this amazing night of animation and food.